Hot walkers are responsible for hand-walking racehorses to cool them down after races and workouts. Hot walkers complete their duties outdoors and may be exposed to changing weather conditions and extreme temperatures. Most hot walkers work 6 days each week. Those employed at the track primarily work morning hours, while those employed at training centers may have additional afternoon hours depending on their facility’s training schedule. Weekend and holiday hours are often necessary. Hot walkers usually travel with their trainer to a variety of racetracks and training centers to provide care for their string of horses. Hot walkers usually find employment in the horse racing industry, most frequently at racetracks but also at training centers and some farms. The Thoroughbred racing industry employs the greatest number of hot walkers. Hot walking is considered an entry-level position, and over time, an employee can eventually move up the ladder into positions of greater responsibility such as groom, exercise rider, or foreman. 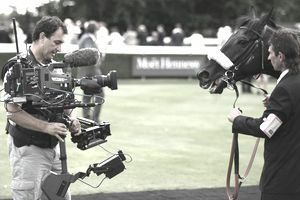 No formal education is required for hot walker positions, and this role is generally considered to be the most entry-level career in the horse racing industry. Basic horsemanship skills and a general knowledge of equine behavior is a plus for those looking for a hot walking position, but on the job training is also possible. Many horse racing professionals started out by “walking hots” at the track and making connections with trainers and assistants. For hot walkers looking to move up into a grooming role, a Groom Elite program is offered at over 17 racetracks in the United States. This 10 session program consists of 40 hours of training (which consists of both hands on and classroom-based sessions). Those who successfully complete the course achieve Groom Elite certification. Additional certification is available in a specialty course that focuses on limb injuries and treatment. Hot walkers that work at a racetrack must obtain an occupational license for the state in which they are working. This licensing process requires an applicant to pay a fee, submit fingerprints, and have a photo taken for an identification badge. No skill testing is involved. Hot walkers must be employed by a trainer to be eligible to apply for their license. Most hot walking positions offer minimum wage compensation, though employees working for major racing entities may receive bonuses or other incentives when the horses under their care win races. Hot walkers generally earn between $7 and $9 per hour, depending on the minimum wage laws in the state where they work and whether there are any additional duties assigned as a part of their position. Many hot walkers at the track complete their duties in the morning and then go to another non-track job in the afternoon or evening to supplement their income. While the Bureau of Labor and Statistics (BLS) does not separate out hot walker salary data from the more general category of animal care and service workers, the average salary in that category was $19,360 annually during the survey conducted in 2009. The bottom ten percent of workers in this category earned less than $15,140 per year, while the highest ten percent of workers in this category earned more than $31,590 per year. The BLS projects that jobs in the general animal care and service worker category will grow at a faster rate than the average for all careers from 2008 to 2018, with expected growth at approximately 21 percent. The BLS does not break down statistics for individual positions within this category, but demand for hot walkers is expected to be relatively stable during this period. While some training centers choose to use mechanical hot walkers (a motorized set of arms or panels that walk horses at a set pace, requiring minimal human supervision), most racetracks rely on human hot walkers to get the job done and will continue to do so for the foreseeable future.